The day opened with Yoon-Kyong Lee, the bereaved mother of Hye-in Doh, talking about her daughter’s battle with a brain tumor and how things were on their journey before and after meeting Ae Ran Hwang and the palliative care team. She shared many wonderful pictures of her family, while she discussed the range of emotions and thoughts, questions and concerns she had through their journey. There were not many dry eyes as she explained how vital having pediatric palliative care was for her daughter and their family. Dr. Friebert gave several presentations in the morning focusing on pediatric palliative care in the U.S. and the global pediatric palliative care movement. Ae Ran Hwang gave the Korean perspective regarding pediatric palliative care. 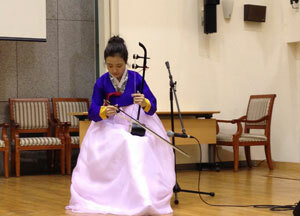 After lunch, we were treated to traditional Korean music, followed by the afternoon presentations from Dr. Friebert and Dr. Chuhl-Joo Lyu regarding the physician’s perspective of pediatric palliative care in the U.S. and Korea. 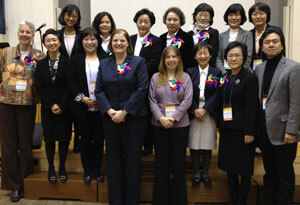 Eun-Kyung Jang and I gave the nurse practitioner’s perspective on pediatric palliative care in the U.S. and Korea. The presentation finished with Erin Whipple and Kyung-Sook Ryu sharing the child life specialist and play therapist’s perspectives on pediatric palliative care in the U.S. and Korea. It was a very full day with an incredible amount of positive energy and enthusiasm to continue to propel pediatric palliative care forward in South Korea and the world. The planning committee took us for a congratulatory Korean dinner, where we were told that the number of registrants ended up being double from their original goal. I cannot begin to explain the incredible hospitality and warmth that was shared with us this week. I have been truly blessed to be a part of this experience and proud to be able to share about our pediatric palliative care team, patients, families, community and administrative support from Akron Children’s Hospital.